Princeton, NJ & Philadelphia, PA – This past weekend, the Big Green travelled to Princeton and Penn to participate in a double-header weekend of Ivy rugby. On Saturday, the Team played Princeton in the first of their two games, winning 71-10 before travelling to Penn on Sunday, where the men achieved a similar score of 67-8 on Franklin Field. The game against Princeton saw the Big Green not only retain possession for the majority of the game, but also excel in many of the areas of the game the Team had been working hard to develop. The effort the forwards had put in outside of the regular practice hours paid off as they scrummaged and rucked efficiently against the Tigers providing quick ball for the backs to play with. The backs, in return, penetrated the space provided to them on the wings via quick hands and the fastest man in Ivy Rugby, fullback John Abraham ’16. Abraham repeatedly left the opposition wings looking for an answer with his blistering pace, scoring one of his multiple tries after chasing down his own chip-kick under pressure. Andrew Zhu ’16, continued his recent form and added a brace of tries to his name in a similar fashion to Abraham as he evaded Princeton’s outside men to score in the corner. Hayden Aldredge ’17, dominated the aerial space as he won multiple tough high-balls off of restarts and contributed greatly to the Big Green’s constant possession of the ball. Other contributors to the score line included the likes of Benji Hannam ’18, Gordon Driscoll ’17, Ryan Maguire ’16, and Dawit Workie ’17. Unfortunately, the meet with the Tigers was not without its setbacks as Captain Jack Braun ’16 was helped off of the field due to a leg injury and was unable to participate in the meet with Penn the next morning. On Sunday, the Big Green arose early to play the Quakers at Franklin Field, home to Penn Football and the famous Penn Relays amongst its other historical characteristics. Faced with a narrower than usual field, the Big Green had to adapt their game away from their typical wide play initially and deployed several crash runners in more central roles in order to eat away at the Penn defense. The lack of space on the wings certainly didn’t deter try-scoring machine Abraham as he collected a hat-trick to his name in the first half of the game. The game against Penn also saw British crew-convert Arthur Sants ’17 debut in the second row and contribute heavily to the preservation of possession at the line-outs and effective clearing of rucks. Other first half tries came from sophomores Benji Hannam and Chris Nkoy, who both ran in tries from 30 plus meters out after finding inconsistencies in the Quakers’ defensive line. Shortly after restarting the game for the second half, Gordon Driscoll ’17 took advantage of Penn’s lack of readiness and ran the ball into the try zone unopposed after taking a quick penalty. Other second half points came from Max Hannam ’16 as he joined his younger brother Benji on the scoreboard after making a line break and fooling the opposition full-back with a dummy pass. 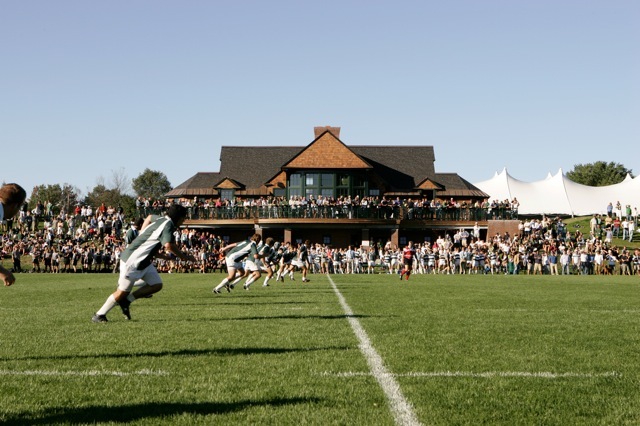 The Big Green takes a break from the Ivy season next weekend (Saturday 31st October) as they engage in a tough friendly with Lindenwood in a Halloween friendly. The Big Green is looking to achieve a win against a tougher opponent with an eye on preparing for the more physical Varsity Cup games in the spring.